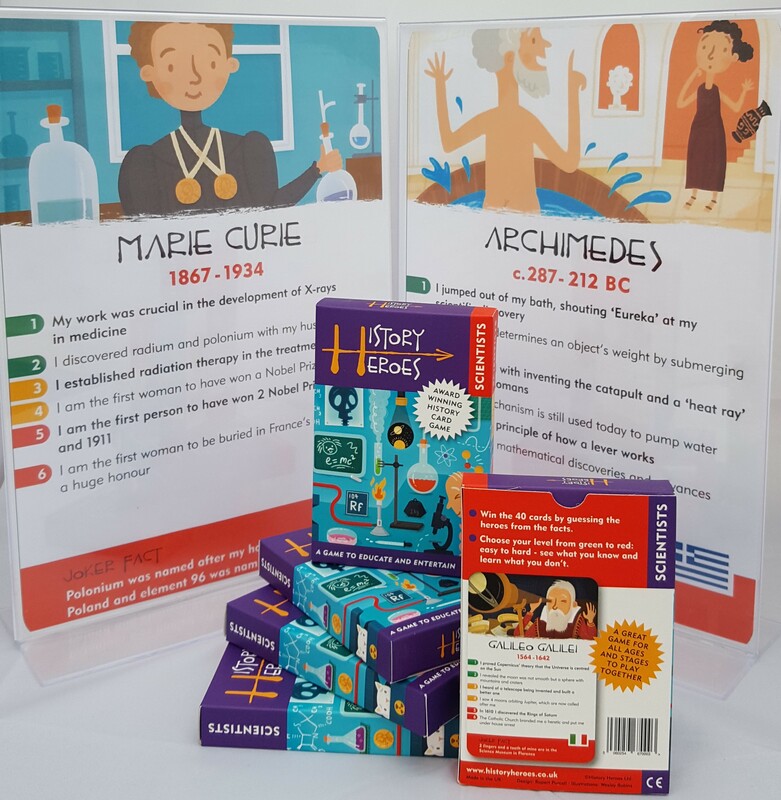 Scientists: a History Heroes card game – a great way to discover some of the greatest scientists throughout history and play a fun quiz game at the same time. 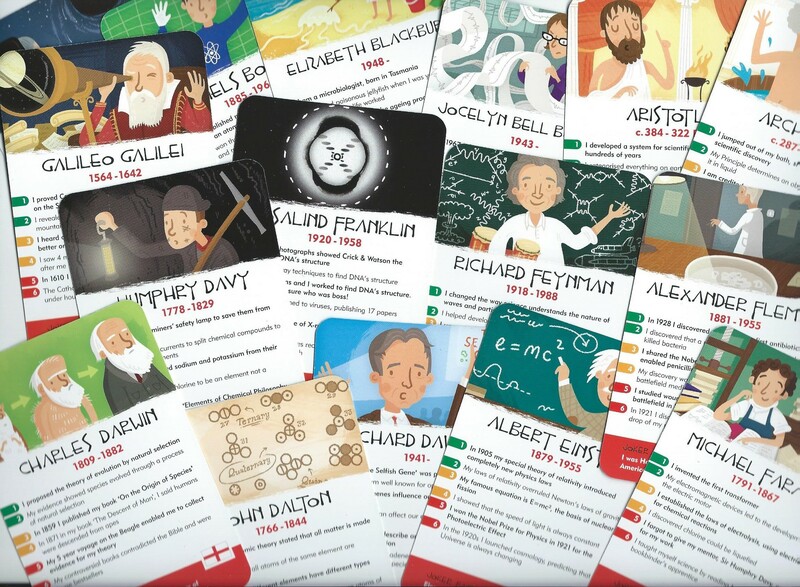 Our pack of Scientists contains individual cards of History Heroes’ forty greatest Scientist Heroes. 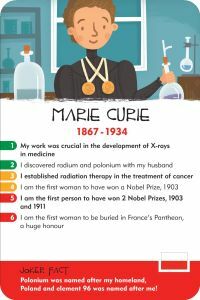 Each card is fantastically illustrated to represent the individual Scientist Hero and shows the scientist’s dates, their flag of birthplace and seven gripping facts about them, including a joker fact about each scientist to surprise and/or entertain. Our Scientist Heroes start with first century BCE scientists, who introduced scientific concepts that we still rely on today: Archimedes and Aristotle. 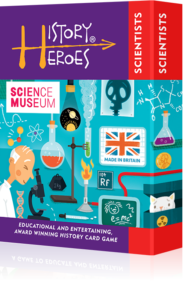 The game includes scientists from so many subsequent centuries to the present day: great names, and their achievements, such as Copernicus, Galileo, Sir Isaac Newton, Robert Boyle and Bunsen. 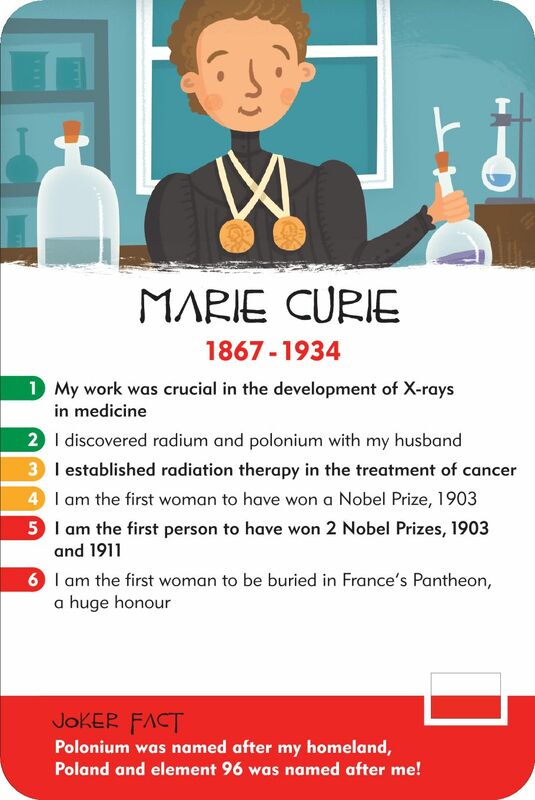 On past the likes of Huxley, Jenner, Darwin and Curie and on to our twentieth and twenty first century heroes, such as Rontgen, Rutherford, Joliot-Curie, Hodgkin, Franklin and Hawking. 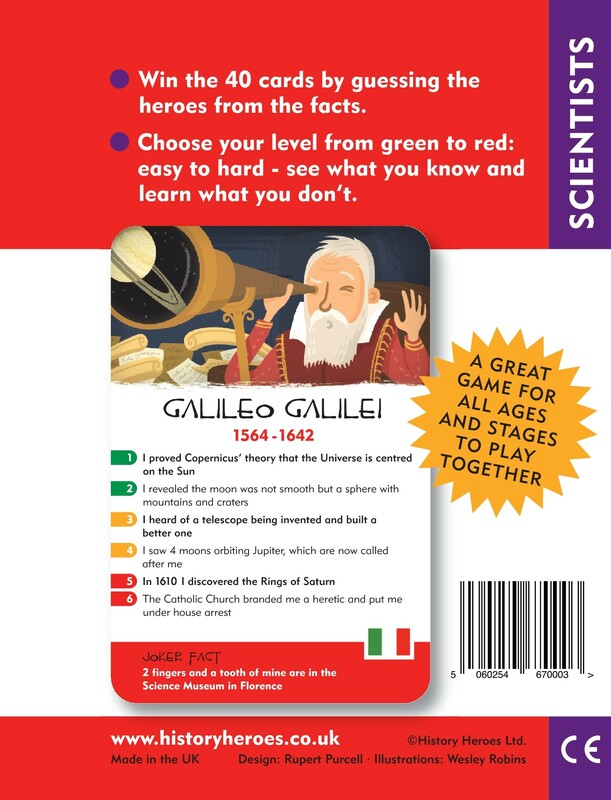 You’ll find these and many more in History Heroes: SCIENTISTS card game, a fantastic way of having fun and learning about the scientists themselves AND the science they introduced to the world. 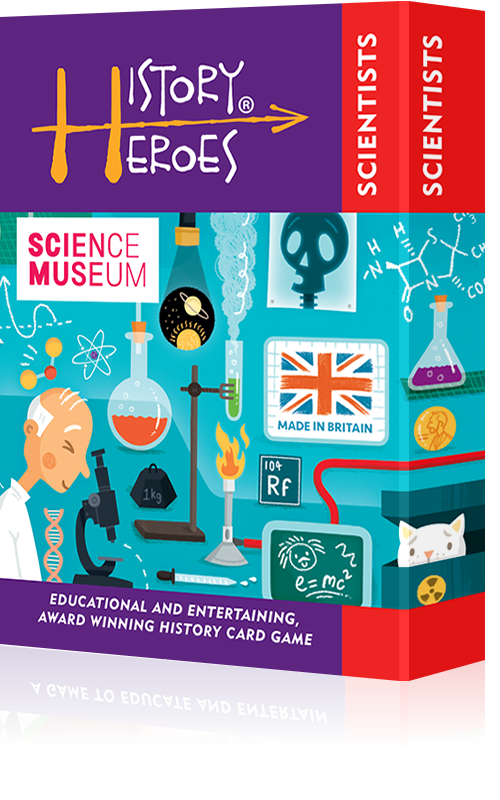 There are many different ways of playing History Heroes: SCIENTISTS card game and you can make up your own rules as long as everyone in the game agrees to them! 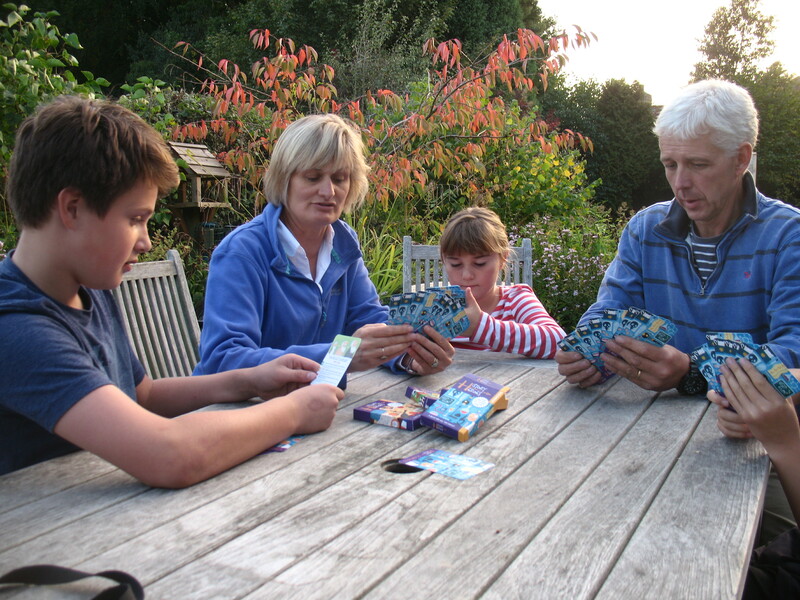 The aim is simple: win the game by winning the cards; win the cards by knowing or guessing the facts. Use the images as clues and the different levels of facts to make the game as easy or as viciously competitive as you want. Or, play the game on different levels within the game so that all ages and stages can play together. The green facts are the easiest, the red most difficult and the joker fact at the bottom is there to entertain and surprise!